Anyone who knows me knows that I plan ahead. Really ahead. My parents used to joke with me about what I planned on doing ten years from now, and I would have an answer. Sometimes, I wish I could be more spontaneous. But, on occasions like this, planning ahead can be an advantageous thing. As I'm preparing to begin another semester of grad school, I decided to work ahead on my Valentine's Day present for my husband. As he is the only source of income for us, we've become good at finding ways to save money. One of the ways we've learned to save some money is through homemade gifts. I've come to appreciate how much time and effort (not to mention, love) goes into these gifts. So, I wanted to share with you what my gift would be this year. Well, the idea came to me when I realized that my schedule for this semester is not really conducive for seeing anyone besides my fellow classmates. So, for a fun way to communicate, I thought I'd bring back the love letter. Or just letter, really. It'll be a nice way to brighten up a day... when there is a letter awaiting opening by an absent loved one. Really, it's just a way for my husband and me to keep the love alive, I suppose. After four years of being together (three of which we lived together), I can say that our relationship can be a bit routine. 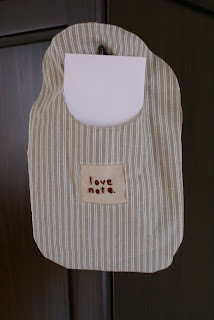 Therefore, my solution = a love letter bag... just waiting to hold it's first letter. With a husband who has his degree in theatre combined with my personal love of movies, I'm happy to say that this is a post dedicated to our latest find: Once. Loved it. Loved it. Loved it. Great actors. Great music. I've always loved movies that make you really feel something. And this movie just brings you into its world. And now I'm listening to the soundtrack (I love it when you can relive the movie in your head from the soundtrack.... Love Actually is another good movie to relive by the soundtrack). The music is almost hypnotic and reflective. Lyrics and melodies are equally good. And I think if I were cool enough to write my own songs, these would be the songs I would want to write. So good. And it helps because the actor/singer in the movie is Irish, which takes it to another level of cool. The actor/singer in this movie reminds me a lot of singer Damien Rice... almost Irish folk rock.... which is my favorite style of music. So, I felt compelled to write a blog about the movie. You should rent it. And you should listen to the music. And, for those of you who appreciate songs for their lyrics, I included my favorite song's lyrics. The name is Say It To Me Now ... lyrics are good, but the melody makes it amazing. Seriously, check it out. And be inspired to be a musician. Say it to me now"
So, at the start of the summer, my husband and his best friend decided that it would be fun to get together once a week and have a jam session. Great. Randy has been needing a hobby (that doesn't include a gaming system) to get his mind off of work. I'm sure I don't know what it's really like for him....graduating with a theatre degree and having big dreams, only to become an insurance claims adjuster. Not really the career of choice. Anyway, so in a few months' time, these jam sessions between best friends have expanded to include a bass player and two guitarists. And suddenly, we have a band. And, before we know it, they have booked a gig. Of course, Randy's best friend's wife (Kim) and I are thinking it may be a good experience for the guys, but it will probably be a flop. We'll still be supportive. After all, it'll give us something to do, too. So, that gig goes surprisingly well. And another gig is booked. And that gig goes even better... and they earn more money than they had agreed on. And now, five more gigs are booked between January and April. Whew. Kim and I are beginning to think that we should assume the position of manager. A gig calendar is definately needed. And I'm shocked that their band is getting such great success. I don't mean that how it may sound. I knew they had talent, but I must say it's so wierd to step back and watch strangers sing along and dance to my husband's voice. And it's so great to see him have so much fun again. Music was his thing in high school and college. And he's in his element. It's a bit of deviation from his original dream of acting, but I think the local musician dream is quickly becoming a reality. I must admit, I'm a proud band groupie.